If you like Friends and need something to write in then come check out this Central Perk journal. 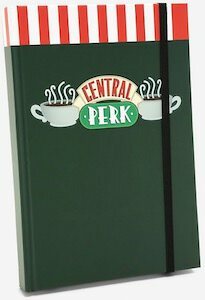 The Friends notebook is green with red and white stripes on the top that looks like an awning and then on the front, there is a big Central Perk logo. The notebook has a black elastic to keep it close when on the go and there is a bookmark string so that you can remember where you are. Inside the notebook, you can find lined pages and these lines are green and on top of each page, there is a small Friends Central Perk logo.